Simply put, Transitions lenses adapt. They adjust from clear indoors to dark outdoors. But it’s not just about light or dark; it’s about everything in between. No matter where you are, or what situation you’re in, Transitions lenses adapt to the perfect shade so you can see with just the right amount of light. 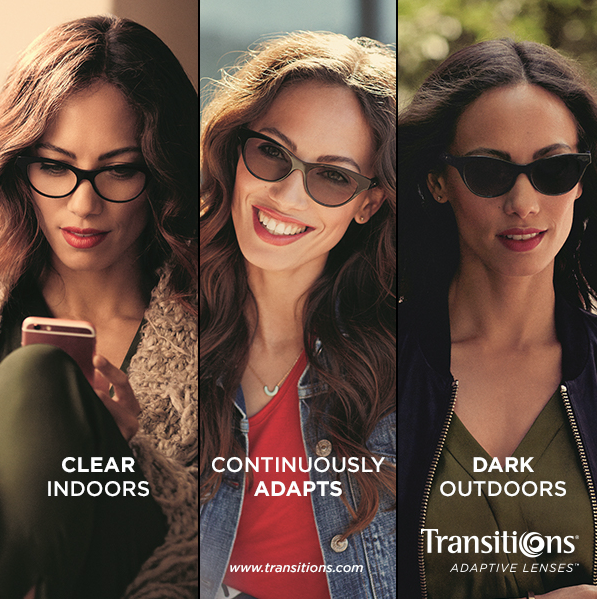 When going from indoor to outdoor conditions, Transitions® lenses help your eyes adjust to changing light better than they would on their own. Demand more from your lenses and have great sight in every light. Transitions lenses are designed to be worn all day long, outdoors and indoors. And you can get them in virtually every frame, style, size and prescription. They’re even great for children. They don’t just make everything look great, they also reduce eye fatigue and strain. They also provide optimum protection against UV and glare, and help protect against harmful blue light both Indoors and Outdoors. THEY FIT IN YOUR FAVOURITE FRAMES. Big bold frames, simple and sophisticated frames, bright colours, designer styles, kids’ sizes, special prescriptions. Transitions lenses are designed to fit virtually every frame, style, size and prescription. THEY ARE RIGHT FOR ANY AGE. No matter what your age, you can always benefit from seeing life with just the right amount of light. Transitions lenses are a great option for kids of all ages because it’s never too early to start protecting your eyes from harmful UV rays. Types of Transition Lenses. Choose the Transitions that are right for you. The most responsive adaptive lenses. Fully clear indoors and darker outdoors. Thanks to our exclusive Chromea7® photochromic technology, they are more reactive to bright sun, partial sun and indirect light – such as light reflected from buildings, cars, and many other surfaces. Noticeably crisper, sharper vision outdoors. Hello world, goodbye glare. Thanks to breakthrough technology, new Transitions Vantage lenses don’t just adapt to changing light, they also polarise as they darken. Outdoors, the polarization adjusts to match the level of outdoor glare, which can vary as the day progresses and conditions change. That means you see life in the best light with less glare for better clarity and colour. Types of adaptive eyewear on offer: Transitions DriveWear Sunglasses, Oakley Sunglasses, Nike Max Transitions Sunglasses, Bell Transitions Face Shields. 94% of consumers are satisfied with how clear the lens is indoors and 70% are satisfied with how dark Transitions® lenses get outdoors. 87% of consumers rated Transitions® lenses as excellent or very good. 82% are satisfied with the speed at which Transitions® lenses darken and 74% of consumers are satisfied with the speed at which Transitions® lenses fade back to clear. Want to know if Transitions Lenses are the right fit for you? Visit the Transitions Official Website, or give us a call on 9345 2234 for more information.